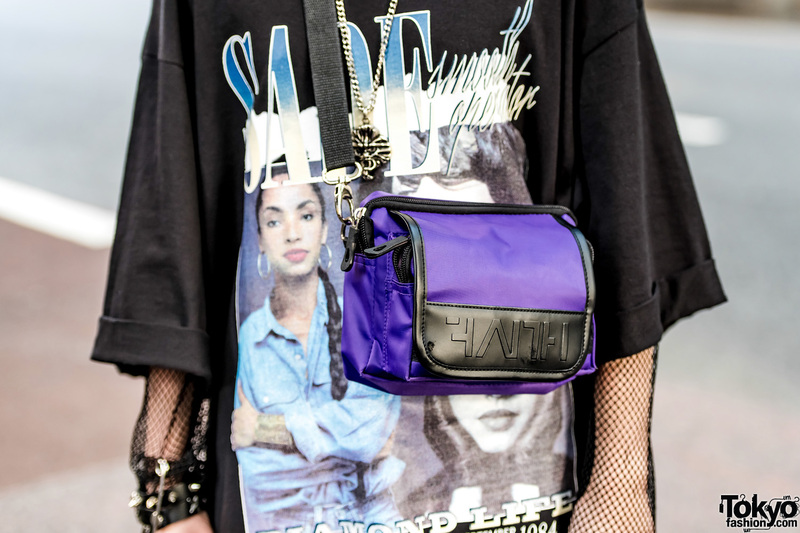 In Harajuku, we came upon two teen girls whose modern streetwear style caught our eye. They are Maria and Megumi. At the left showcasing a red-and-black ensemble is Maria. 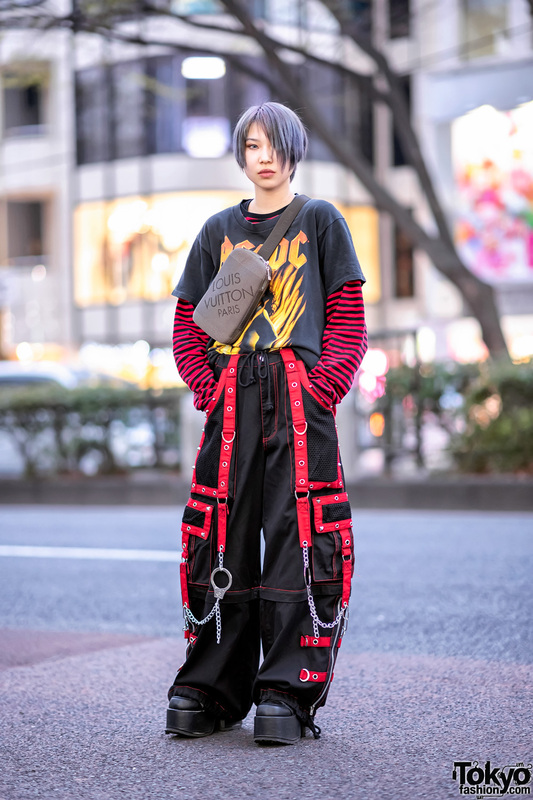 The 15-year-old student is clad in a red cropped jacket with a zippered front and boatneck neckline from (Me) Harajuku, which she wore on top of a black cropped top and a mock-neck long sleeved sheer top. 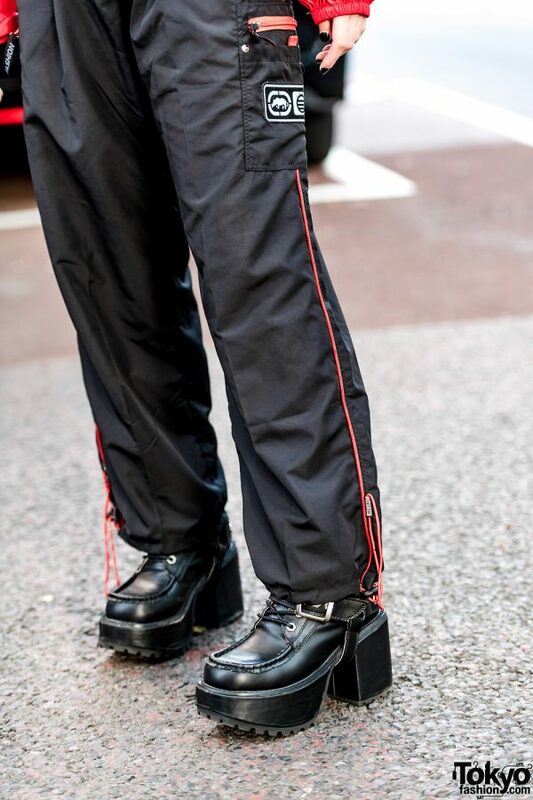 She styled her layered tops with black track pants with contrast red trims from Faith Tokyo and slipped into platform leather ankle booties from Out Of The World. Maria accessorized her look with oversized red-framed sunglasses, silver chain earrings, a leather o-ring choker, and a black leather grommet belt, some of which are from (Me) Harajuku. 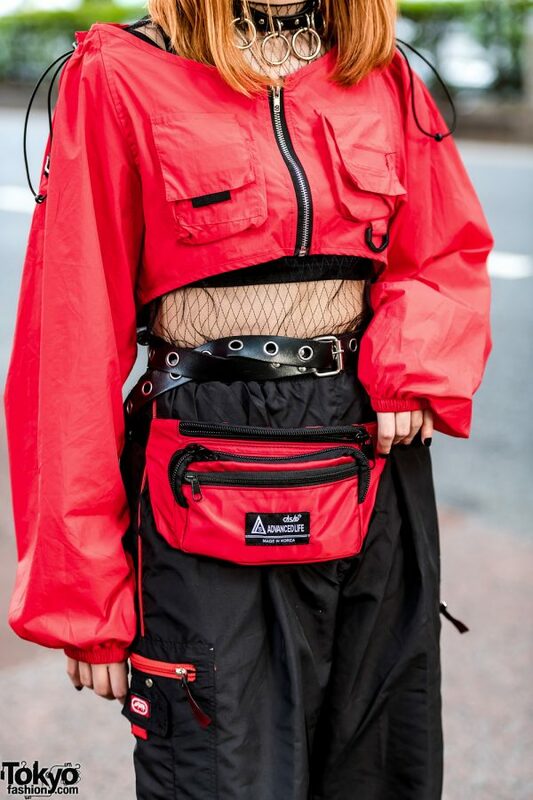 In addition, Maria is sporting a red-and-black waist bag from (Me) Harajuku. Never Mind the XU and Faith Tokyo are two of Maria’s favorite fashion brands/shops, and she likes listening to hip hop music. Maria is active on Instagram. 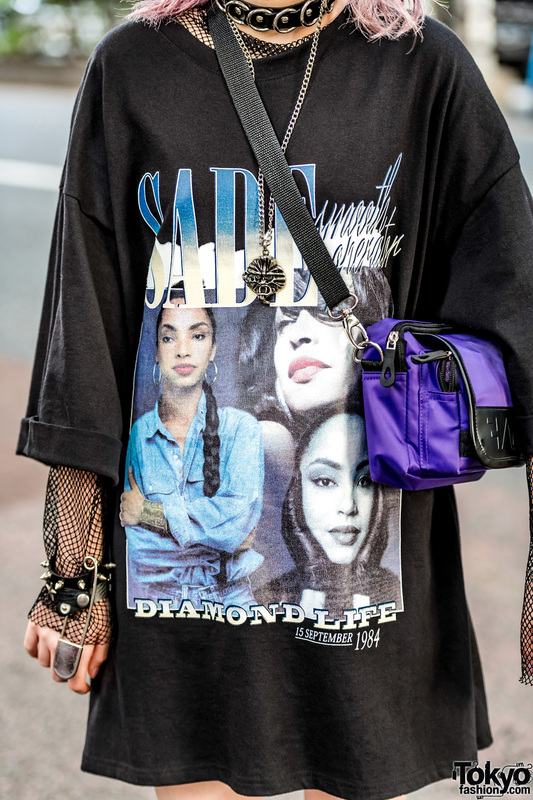 Meanwhile, Megumi – sporting purple twin tails – is decked out in an oversized black Sade t-shirt from (Me) Harajuku, which she wore as a dress over a long sleeve fishnet top. 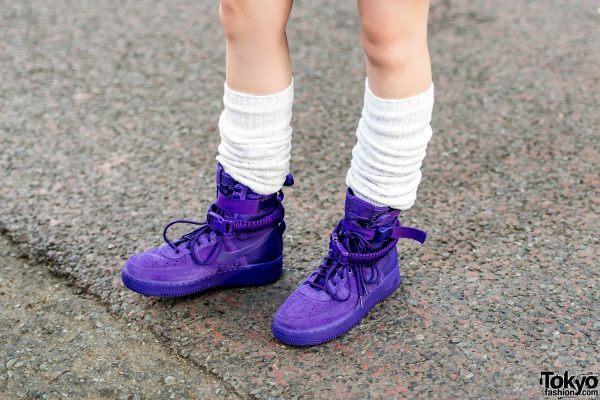 Thick white tube socks, purple Nike high top sneakers, and a purple-and-black sling bag from Faith Tokyo completed her outfit. 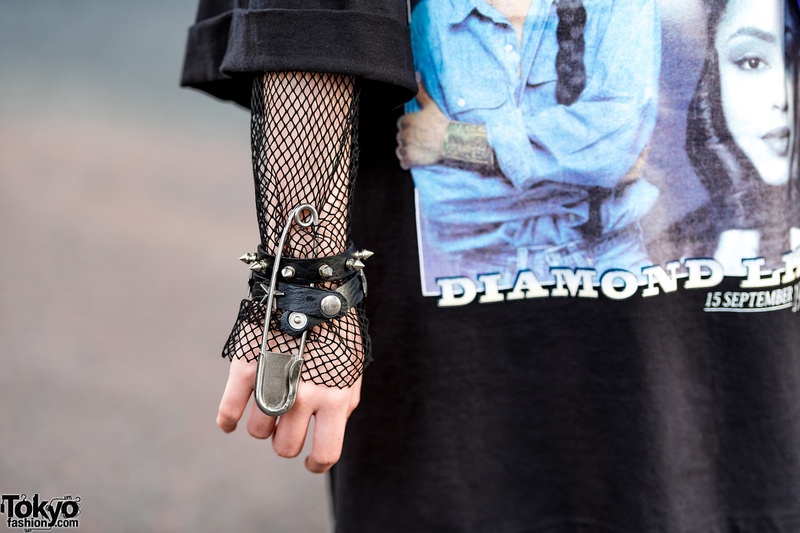 Megumi’s accessories – from Never Mind the XU – include a leather o-ring choker layered with a long chain pendant necklace and a studded leather cuff bracelet embellished with an oversized safety pin. Megumi lists Open The Door, Faith Tokyo and Never Mind the XU as her fashion favorites and she enjoys the music of Twice and Pentagon. 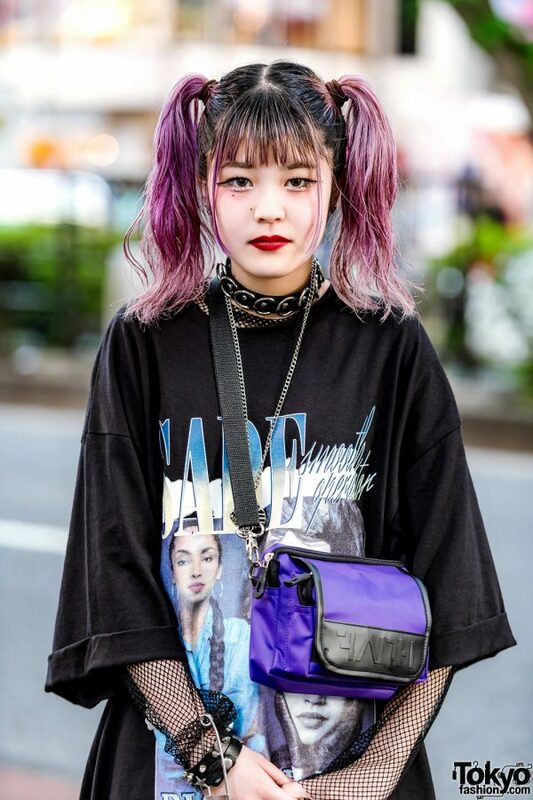 Check out Megumi’s stylish feed on Instagram and Twitter.